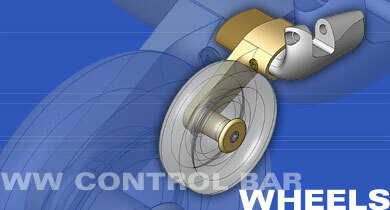 Wills Wing now offers a wheel kit designed for use with our faired aluminium basetube. The kit consists of a pair of UHMW wheels, mounting brackets, and required hardware. The brackets fit over the faired aluminium basetube and are secured in place using the bolts which attach the basetube to the corner brackets. The wheels mount on small axles at the ends of the brackets. These wheels offer minimal added drag and weight, preserving the advantages of the Slipstream or Litestream Control Bars. The brackets are the usual clear-anodized aluminium color. The illustration shows them as a yellowish/brass color for clarity. Wills Wing offers three types of control bar wheels for gliders equipped with round basetubes – Hall 5 inch Hard Plastic Wheels, Finsterwalder 8 inch Pneumatic Wheels, and Finsterwalder 10 inch Pneumatic Wheels. The Hall Wheel is a 5” diameter, 2” wide molded hard plastic wheel, and comes with a hub and mounting screws. The Hall wheels are best used as “safety” wheels to protect the pilot in the case of inadvertent contact of the basetube with the ground during an awkward landing. They are normally mounted semi-permanently to the basetube with the included self-clamping hubs, and then the basetube is simply removed at both ends from the basetube end brackets when packing up the glider. The Hall Wheels fit the standard 1 1/8 inch diameter round basetubes, and the hub on one of the two wheels will accommodate a VG rope (the wheel turns on the mounted hub, rather than on the basetube). The Hall Wheels are priced and sold in sets of 2. The Finsterwalder wheels are pneumatic wheels of larger diameter. The 8” diameter Finster Wheel is 2 inches wide, and the 10” diameter Finster Wheel is 3 ¼ inches wide. Either wheel offers increased protection in a wheel landing situation, and the wider 10” diameter wheel is great for use in training situations, or for pilots who prefer to land on the wheels on a regular basis. The Finster wheels slide easily onto the basetube and rotate on the basetube. They are each available with either the standard 1 1/8 inch inside diameter bushing for the most common basetube size, or with a 1 ¼ inch inside diameter bushing which fits the Falcon Tandem basetube. The Finsterwalder Wheels are priced and sold as individual wheels – two are required.